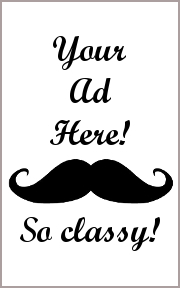 You can’t be sheepish if you want to dominate the pasture! Chances are you’ve heard the saying, “the grass is always greener on the other side.” This saying suggests that other circumstances are seemingly more desirable than an individual’s current reality. Which might or might not be true. But what if there is no “other side”? Wouldn’t you want as much of that grass (regardless of color) as possible? In this game, you’ll be leading your sheep to expand and control limited pasture space. There are no wolves in this game. Just a lot of aggressive mutton. 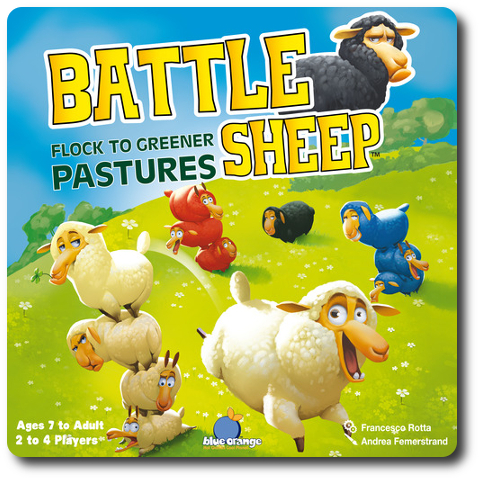 Battle Sheep, designed by Francesco Rotta and published by Blue Orange Games, is comprised of 16 Pasture boards and 64 Sheep tokens (in 4 different colors, 16 sheep per color). The Pasture boards are made of thick cardboard and the Sheep tokens are made of thick plastic. A very durable game made with high quality components. Second, each player should take 4 Pasture boards. They are all the same, so there is no need to randomize who gets what. Third, players now take turns placing 1 Pasture board at a time to the middle playing area. All Pasture boards should be connected by at least 1 side. Spaces between the Pasture boards is simply “par for the course”. Players should feel free to create as small or as wide a playing area as they like. Fourth, determine who the first player will be (the rules suggest the “youngest players”). Starting with the first player and going in turn order sequence, each player takes all 16 of their Sheep tokens and creates a “stack”. A “stack” is all the Sheep tokens stacked up on each other to form a single column. THAT’S A LOT SHEEP! The stacks are placed on an open Pasture space (each Pasture board has 4 Pasture spaces) located on the outside perimeter of the playing area created by the players. The rules suggest that the players use their own Pasture boards, but good luck remembering whose board belongs to which player. Just placing the starting sheep stacks on the closest Pasture space is perfectly fine. That’s it for game set up. Time to play! Battle Sheep is played in turns with no set number of turns per game. Starting with the first player and continuing in turn order sequence, each player will take any sheep stack of Sheep tokens they have and split them. A “split” is not defined by any specific number. All that is required is leaving at least 1 Sheep token in the original sheep stack position. For example, the initial stack of 16 Sheep tokens could be split into two stacks of 1 and 15 or 5 and 11, and so on. When moving the Sheep tokens from a split stack, they must be deposited in an empty pasture space that is in a straight line from the originating pasture space. 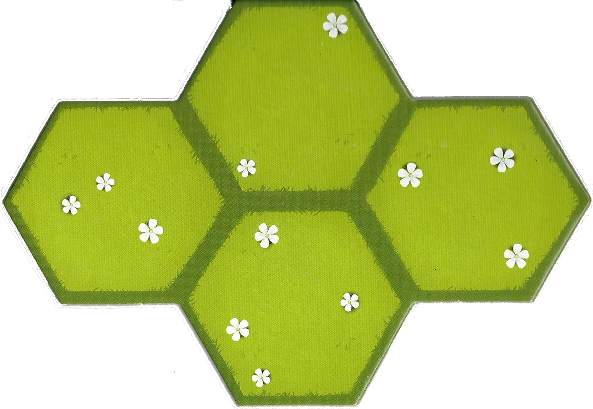 A “straight line” is defined by the pasture space hexes that are adjacent to each other. This means a sheep stack could possibly move in 6 different directions. All the Sheep tokens in the split sheep stack move together. Players do not deposit them as they move across the Pasture boards. The player must move their sheep stack until one of the following conditions occur. Note: If the player is unable to move a sheep stack, their turn is over and they are out for the duration of the game. Once the player has finished splitting and moving a sheep stack, the next player in turn order sequence takes their turn. The game continues until all the players are unable to move any of their Sheep tokens. 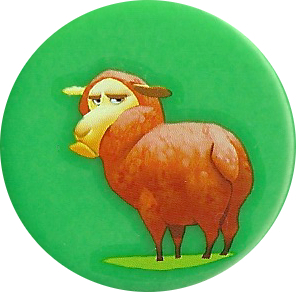 Players now count of the number of pasture spaces their Sheep tokens occupy. The player who captures the most pasture space wins the game. If there is a tie, the player with the largest herd wins the game. A “herd” is defined by the largest grouping of sheep of a single color that are connected by at least 1 side. 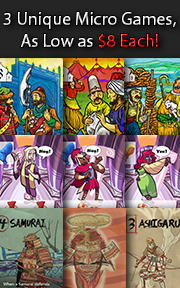 To learn more about Battle Sheep, visit the game’s web page. Battle Sheep would appear to be a very simple game to teach and to demonstrate. Players aren’t really going to “get the game” until they are playing it, however. The open pasture will quickly become filled with sheep and the number of choices a player will have will be reduced. A player must think through their moves, at least 2 steps ahead, if they are to remain competitive. I believe the Gamer Geeks will enjoy the game, but not be overly thrilled by it. While the game does require logical thinking, it’s very light on strategy and tactics. If it’s too light, the gaming elitists will pass on the game. The Parent and Child Geeks should very much enjoy Battle Sheep. Its casual game play and easy learning curve means it can be played by the entire family. Perfect for the family gaming table or for Parent Geeks who want a quick game with their peers that won’t take long to set up and complete. Teaching Battle Sheep is best done by example. Make sure you put emphasis on two important points. First, sheep stacks cannot be restacked. Second, sheep cannot jump over other sheep. This isn’t Checkers. After that, it’s pretty much cake. The only possible issue you might run into, especially with the younger Child Geeks, is keeping moves in a straight line. Note that this game doesn’t require reading and what little math there is can be done by any player without upsetting the game’s balance. This means Child Geeks younger than the game’s recommended minimum age can sit down and play the game. And so, after teaching the game to all 3 of my little geeks, I asked them their thoughts on Battle Sheep so far. On average, it took the Child Geeks at least 1 game to get the hang of it. This should not suggest that the game is difficult, because it certainly is not. The learning curve is easy and what little rules there are to the game can be written on the back of a cocktail napkin. The Child Geeks were surprised how quickly the pasture was populated and their choices became limited. After observing how moving sheep stacks in certain locations and at certain times both benefited and obstructed players, the second game of Battle Sheep was a lot smoother and fun. According to one Child Geek, “You have to see how the sheep move at least once before you understand how to play the game.” Another Child Geek said, “I like this game. It’s fun to try to trap your parents!” Note that Child Geeks as young as 4-years-old were able to learn and to play Battle Sheep, but not well. All the Child Geeks, regardless of their age, voted to approve Battle Sheep. The Parent Geeks found Battle Sheep to be a fun game to play at the family gaming table and with their peers, but only to a point. According to one Parent Geek, “This is a wonderful game to play with the family, but I would only play it with other parents if I knew they weren’t into gaming.” Another Parent Geek said, “Great game. Easy to learn and easy to play without being easy to win. I would play this again.” All the Parent Geeks agreed that Battle Sheep was a great game for the family and found it could be a lot of fun with non-gamer adults or gaming adults who just wanted a casual game. Battle Sheep was approved by the Parent Geeks. The Gamer Geeks enjoyed the idea of Battle Sheep. They found that the module Pasture boards allowed for different and unique game playing areas each time and the tactical game play (albeit light) was most certainly there. What they didn’t care for was the lack of depth the game provided. According to one Gamer Geek, “There simply isn’t much to this game. Each game is the same. The only difference is the game playing area.” Another Gamer Geek said, “There might not be much to this game, but it is a fun game, all the same.” And finally, another Gamer Geek said rather authoritatively, “Any game I can play other than Candy Land with my kids is an AWESOME game.” Battle Sheep received mixed reviews from the gaming elitists. Some found the game to be light and fun, perfect for when a quick game was necessary. Others found the game to be only suitable for family and children. It’s worth noting that none of the Gamer Geeks thought Battle Sheep was a “bad game”. I found Battle Sheep to be a great game to play with my kids and families, but do not enjoy it with my gaming elitist friends. Like many of the Gamer Geeks, I found that Battle Sheep lost its appeal fairly quickly. As Abstract Strategy games go, Battle Sheep is a great one to introduce to younger players and non-gamers. For the inexperienced, there is a lot to consider. The game is quick to play and allows multiple game playing sessions in less than an hour. This provides new and inexperienced players an opportunity to try new things from what they learned from their previous game only moments before. That, to me, makes for a great gateway game and a welcomed addition to the family gaming table. If you are looking for an easy to learn and fast to play Abstract Strategy game that can be played by Child Geeks and enjoyed by adults, do take a moment to try Battle Sheep. 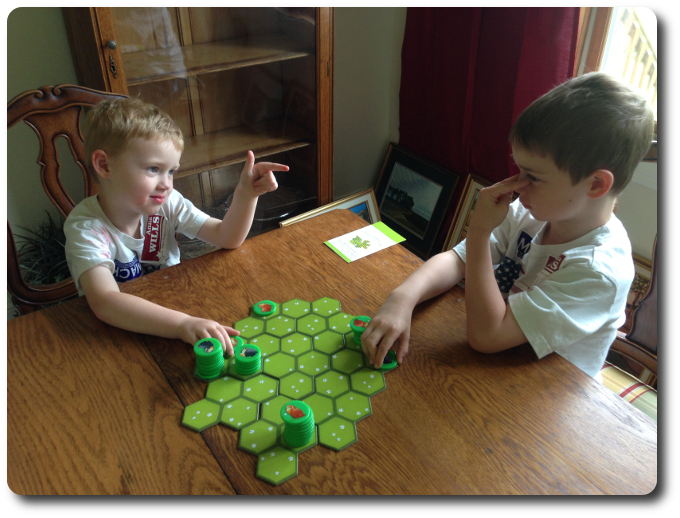 Tagged Abstract Strategy Games, Child Geek Approved, Parent Geek Approved. Bookmark the permalink.